LIMITED TIME OFFER - FREE UNTIL JULY 15th! Have you ever had a conversation with your friends or family and wondered "Hey, is ____ still alive?" Well now you can answer that question quickly and easily with DK Digital Media's "Am I Alive?" app! Am I Alive works for most celebrities, actors, politicians, sports figures, or anyone else who may be semi-well-known on the internet. 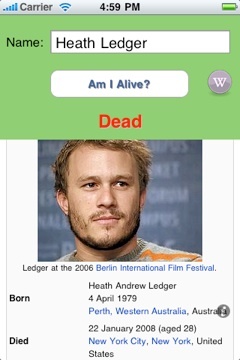 In addition to the quick "Alive or Dead" answer, detailed information on the person can also be displayed quite easily. Enjoy this free app from DK Digital Media!